Like we need another Tesco! I am appalled and amazed that Tesco wants to build a superstore on some waste land near to my home in Nottingham. This land was ear marked for development a number of years ago by the East Side City project, but due to the economic down turn Tesco have purchased the inner city brown field site to build another faceless alter to consumerism. With in a 5-10 minute walk/drive of the site there are 7 other Tesco outlets (from metro stores to proper supermarkets). The company have taken advantage of a loop hole in planning laws that allow disused pubs to be converted to mini markets with out re-licensing. 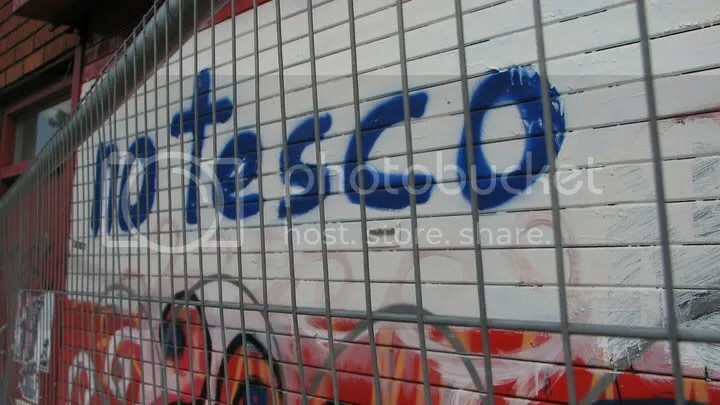 ‘No Tesco Eastside’ is a group opposed to the building of a new Tesco on Eastside (formally Boots Island) in Nottingham. The area that will be most greatly effected is Sneinton, a wonderfully artistic, vibrant and multicultural area of the city. Sneinton has a number independent shops and excellent world supermarkets that will be in danger from the giant that is Tesco.